This is the campaign log for the thirteenth session of a google+run Wandering Heroes of Ogre Gate campaign. The previous session is described HERE. After killing Zhi Zhu and Kang in Zun City, the party traveled back to Zhaoze sect. The fastest path was straight through Zhaoze Swamp, so they stopped in Bouzhou and got boats for their army. The effect was it may have been quicker to go the long-way around the swamp but they still were on track to make it to Zhaoze Island by the wedding date. On their way, a tired messenger wearing Golden Dragon regalia caught up to the party and said that Bronze Master wished to give a wedding gift to him in person (that he was at Zhaoze Swamp Pavilion, the residence of The Witch of Zhaoze Zhou). The party was a touch suspicious and approached the pavilion cautiously. There they found Bronze Master with a disciple of his named Fearless Cat. He said he wanted to arrange a wedding between Fearless Cat and Bone Breaker, that Little Venom didn't have a suitable temperament for his sworn brother and came from a relatively small sect. Bone Breaker was a bit torn. He didn't want to go back on his agreement with Zhaoze Sect, but he asked for more details. Bronze Master told him that Fearless Cat was one of his best students and the child of Iron-Clawed Lion (master of The Majestic Lion Cult). In addition, it was very possible her mother was the leader of Mount Hai'an Sect. He pointed out that Zhaoze Sect had a mere 30 or so members, while Majestic Lion had nearly 1000. Bone Breaker decided to test Fearless Cat's Kung Fu by having her fight San. His sister agreed and the two squared off in the swamp. San fought with her fans and Fearless Cat used her iron claws. Fearless Cat leapt at San and stabbed her torso with the claws. San tried to kick her in reply and missed. Fearless Cat then assumed a quick meditative posture and created a large emerald globe around San, which began to crush her. It squeezed her for several moments and she tried to break the globe, slightly cracking it before it dissipated on its own. San then managed to kick her a few a times but was struck badly by the claws and acknowledged defeat. 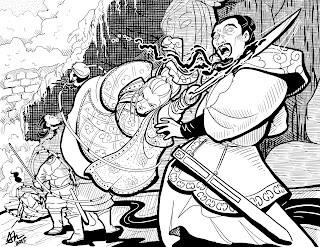 During the fight, Abbot Firebrand was visibly shaken when he saw the emerald globe, which he told Bone Breaker was a secret technique called The All Encompassing Emerald of Sun Mai. Bone Breaker told Bronze Master he was impressed, but that he had to keep his agreement with Zhaoze Sect. Despite several attempts to convince him otherwise, he would not change his mind. Bronze Master understood and promised to send him a proper gift (telling him he would send the bodies of Lingsu and Min). The party tried to recruit Fearless Cat nonetheless, asking if she'd agree to marry Chen. She was insulted and angered, refusing such an arrangement. She did agree to go to their tournament however. They reached Zhaoze Island and held the wedding. During the night, Chen and Venom of Zhaoze spoke. The latter took a liking to the young poisoner and offered to be his sifu. He agreed and began learning Naga Palm Technique. 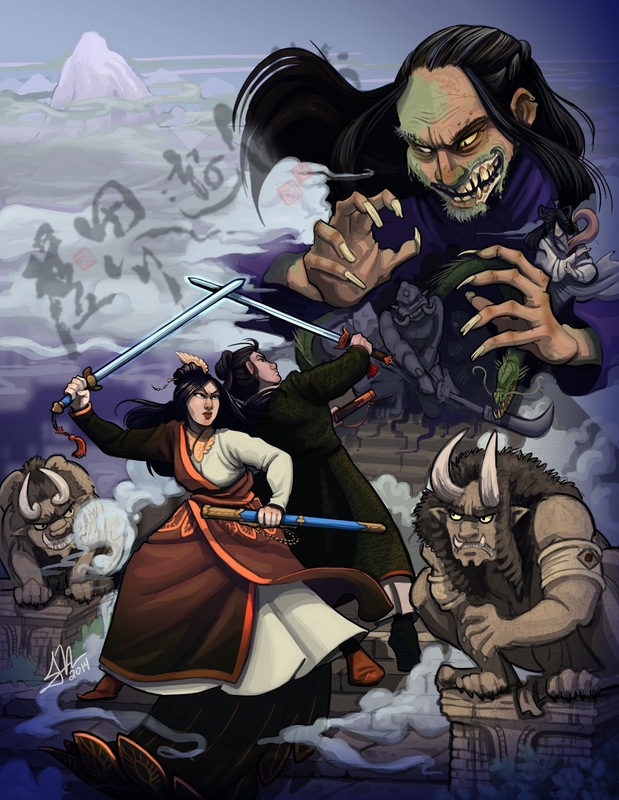 After the wedding they traveled to the city of Rong-Yao where One-Armed Fiery Demon was imprisoned (Bone Breaker had learned this through his information network). They met with an official who informed them that she was to be executed for slaughtering people in the streets. However a bribe of around 20,000 spades persuaded him to let them see her and secret her out of the city (whereupon the official grabbed another prisoner and had her executed in One-Armed Fiery Demon's place). One-Armed Fiery Demon was reluctant to speak but when they showed her the Wind Saber of Sunan, she lit up and said "I must have that blade". Bone Breaker asked why and she explained that she and her husband had stolen it long ago, but it was taken from them by Lady White Blade (who also killed her husband). She also explained (after some questioning) that she was in jail for killing members of Mystic Sword Sect (due to her grudge with Lady White Blade). Bone Breaker told her that Zhi Zhu and Kang were dead, as was Lady White Blade. She asked if Zhi Zhu died fighting, and he told her that she had. He then asked if she would join him if he gave her the sword. She agreed and pledged to serve him. She cautioned him that she would kill any Mystic Sword sect members on sight. This was a problem, he explained that he had some Flying Phantoms in his service. She said she'd kill them if they crossed paths but wouldn't go out of her way to hunt them down. This was the best agreement he could work out, so he told Nuan to return north and told her to keep the phantoms away from One-Armed Fiery Demon. They took One-Armed Fiery Demon with them, and she quickly assumed the role of bodyguard. On their way back from Yuzhing, Little Venom informed Bone Breaker that she was pregnant. The ship became a floating festival as The Venom of Zhaoze encouraged everyone to drink and sing. By their return, Chen had nearly mastered Naga Palm under the tutelage of the Venom. When they reached the Inn, Iron Cub informed them that the structure for the tournament was complete. In his room, a gift awaited Bone Breaker. It was from Senior Grand Councilor Cai Yuanyu; a neckless with a round, red medallion and a note saying "to be worn by your wife". Before the tournament he went with the party to Fan to meet Senior Grand Councilor Cai Yuanyu. There he also went to a Yen-Li temple and recruited a priest named Mak and his wife to teach him about the religion. The Senior Grand Councilor told Bone Breaker that he had found a solution to his arraignment with Heaven Palace Sect (they had shortened his life to five more years in exchange for making land around the inn fertile). If Bone Breaker would bring his pregnant wife to the Demon Palace after it was restored by the Key of Yao-Feng, they would forgive his debt (if he did not, his child would die). Provided she wore the Heart of Yao-Feng (the necklace he had gifted them), his son would become the Demon Emperor and their plans to invert heaven would be underway. Bone Breaker quickly agreed. On his return he continued to learn from the priests in the month leading up to the tournament. However one night the couple broke into Sand Demon's room and tried to capture him. The party found them entangling sand demon with a rope and trying to imprison him in a gourd. They were able to stop the couple and killed them on the spot. This greatly upset Abbot Firebrand, which confused the party because when they met him, he'd been smashing out peoples' teeth. But he seemed upset over the bloodshed and said that he would be reborn as a worm or worse for his killings. He said, they were killing without reason, that he could accept it from time to time, but that it had become too much. Bone Breaker promised to let Abbot Firebrand make the call next time and this seemed to satisfy him. The tournament came and ten competitors entered to compete for possession of the Jade Turtle (including several of Bone Breaker's own men): Yang Tuo, Jade Priestess, One-Armed Fiery Demon, Madame Hamaya, Zhou Gui, Chef Wu, Cai Bao, Nergui, Fearless Cat and Chen. The first match was between Nergui and Madame Hamaya (with Nergui as victor). This was followed by Yang Tuo and One-Armed Fiery Demon, with Yang Tuo defeating her (and also using the All Encompassing Emerald of Sun Mai). In the next match, Chef Wu fought Cai Bao and greatly disturbed the crowd by hacking his opponent to death after striking him down. They dragged the chef off of the blood covered grounds and forced him to agree to use restraint in future matches. The following match was Chen (a member of the party) and Zhou Gui (owner of the Silk Tavern). They prepared to face each other.